For the very first time I read my cake records wrongly and supposed to make two different colours for the cake and I read it as either colour (realised it only after I've completed the cake). Felt really really sorry for the mistake I made. I sincerely apologies to Aeryn's mom. Luckily I was told that Aeryn is happy with it especially the Miss Naughty and dog is just like what she wanted. 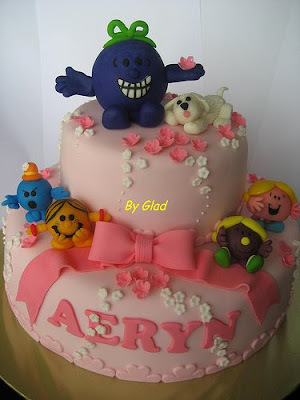 Aeryn, I hope you like the complimentary Little Man that I made for you.